New Yorkers -- and the NYPD -- are wondering why there weren't barriers that could have stopped a car from getting onto the Hudson River Greenway after Tuesday's deadly attack. Chris Glorioso reports. New York City's top cop said the city is looking into adding additional traffic barriers at the popular bike path where a man mowed down pedestrians and cyclists, leaving eight dead and a dozen others injured. Police Commissioner James O'Neill said in a briefing on Wednesday that they're looking into adding additional traffic bollards in the wake of Tuesday's attack on the Hudson River Greenway. The city Department of Transportation said it is also looking to add more barriers in the area in the near future. The suspect, Sayfullo Habibullaevic Saipov, is accused of driving a truck he rented from Home Depot down the bike path before steering into a bus in an ISIS-inspired attack; O'Neill said he entered the path from a part where there were no bollards that could have stopped the attack. "I know that bike path very well," O'Neill said. "I don't think there are any Bollards at Houston Street. So of course, we're going to take a look at that now." 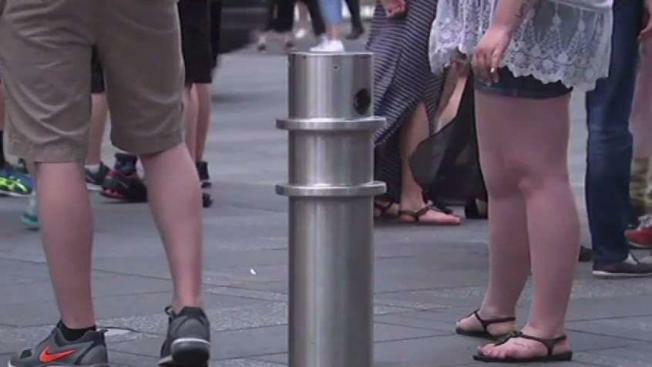 Rob Reiter, a pedestrian safety consultant who worked with the company that installed bollards in Times Square, called the lack of bollards around the busy bike path a "safety oversight." "You're adding to the target list," he said. Reiter compared Tuesday's attack to one in Barcelona in 2017; in both cases, he said, bollards could have stopped the bloodshed before it got started. "It's poor safety planning," he said. Lawmakers, too, are calling for additional safety measures in pedestrian areas. U.S. Sen. Kirsten Gillibrand announced the Stopping Threats on Pedestrians Act, or STOP Act, on Wednesday, which would create a new grant program at the U.S. Department of Transportation that would provide more funding for the installation of traffic barriers. And New York City councilman Ydanis Rodriguez said he introduced a similar measure at the local level earlier this year after a driver hopped a curb in Times Square and ran down several people while allegedly intoxicated by PCP. "Pedestrian bollards will stop a vehicle if they intend to use it as a weapon of mass destruction," he said.